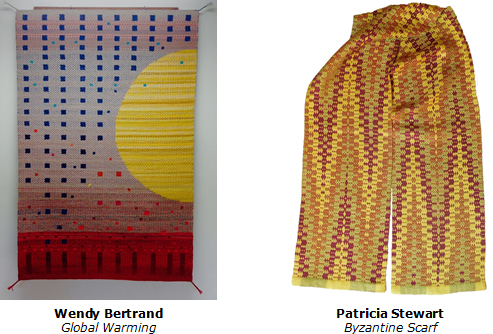 The East Gallery is presenting Woven Together: Experience and Expression, an exhibition of gorgeous woven textiles from the Loom & Shuttle Guild, a San Francisco-based weaving guild founded in 1948. There are colorful scarves, wonderfully crafted jackets and other pieces of clothing, as well as wall-hung art pieces. The techniques used range from spinning and weaving to tapestry, and from kumihimo, a Japanese form of braid-making, to weaving on a rigid heddle loom. These highly talented artists will give the following series of demonstrations during their exhibit. The public is invited to join the Loom & Shuttle Guild artists on closing Sunday, Feb 12, 1:30 to 3:15 pm, for their closing gathering and casual gallery walk-through. Sanchez Art Center is located at 1220 Linda Mar Blvd in Pacifica, about a mile east of Highway 1. Following opening night, the galleries are open Friday, Saturday, and Sunday, 1–5 pm, and by appointment, through Feb 12. For more information, info@SanchezArtCenter.org or call 650.355.1894.